Look! It's all done! Well, not really. 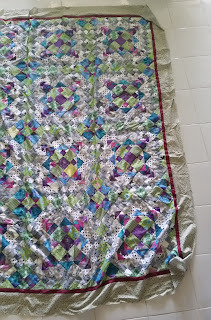 It still needs batting, backing and quilting, but the top is all done. 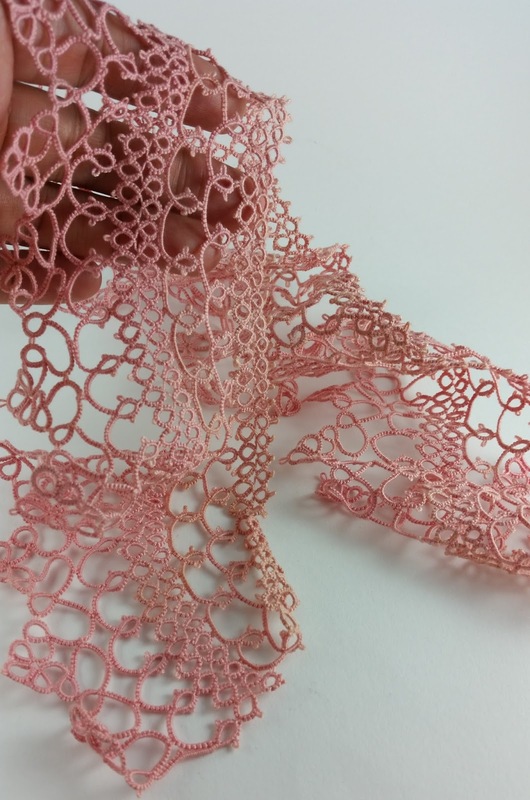 The design is Linda Franz's COTSIM. It's entirely hand stitched. 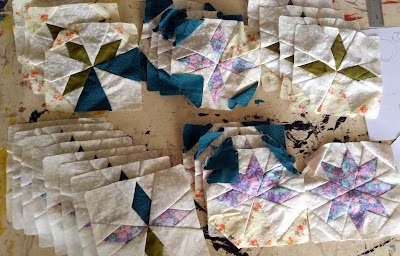 Now I'm deciding whether to try hand quilting it. 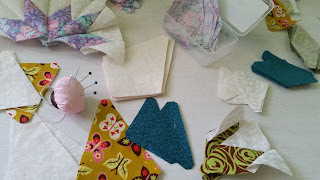 After a hand sewing marathon I finally caught up with all the clues for Linda Franz's current Inklingo mystery. Yea! Can't wait to see how they are all going to go together. My kids and I ran a craft booth with a friend of ours last week, so all of my crafty time got turned into booth prep time. 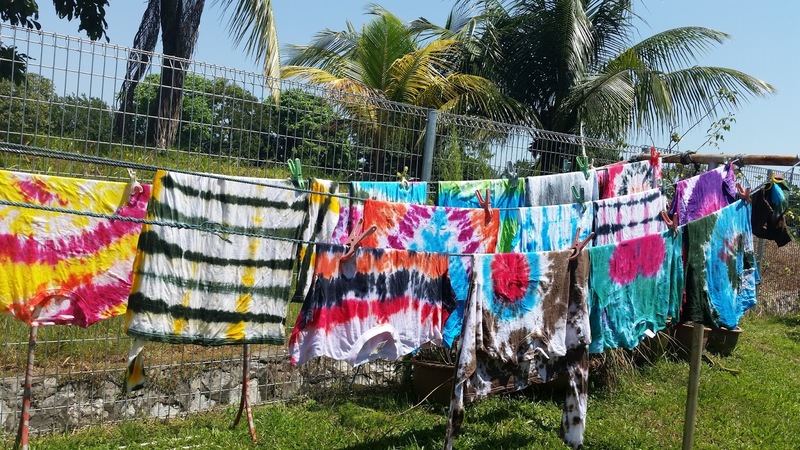 We had a great time and and sold a lot of tie dye t-shirts. Even though it was a fun weekend, I'm glad to have my craft time to myself again and to get back to working on my own projects. I'm actually working on some mystery quilts. I'm working on Linda Franz's Inklingo COTSIM mystery. Unfortunately, there have been setbacks I've gotten really behind. First, I couldn't find freezer paper, then my printer broke down. I finally got a spare printer set up, so I'm planning a little sewing marathon this weekend. I also got to figure out how to finish this big thing. It's so big I don't know how to photograph the whole thing. This is a finished Easy Street top designed by Bonnie Hunter. 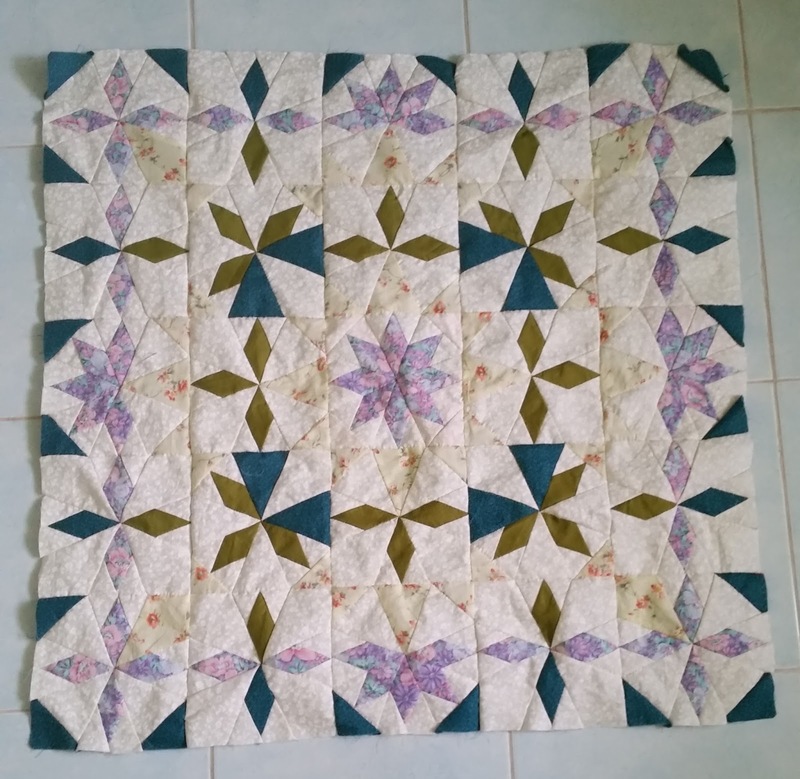 I started it years ago but only now have the skills to finish it. 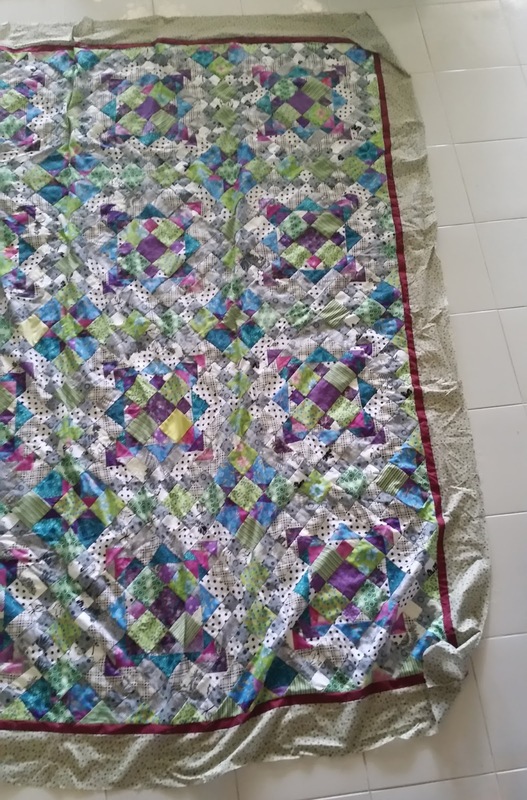 Now I have to figure out how to quilt it. 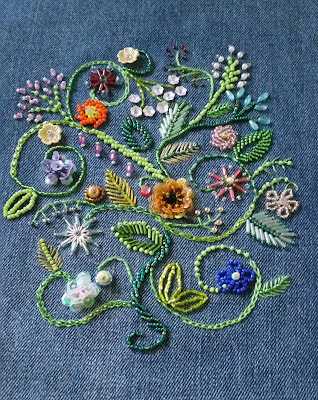 Malaysia is a great country for bead embroidery. Beads are sold everywhere, and it's easy to find a skilled embroiderer to embellish your clothing for very reasonable prices. 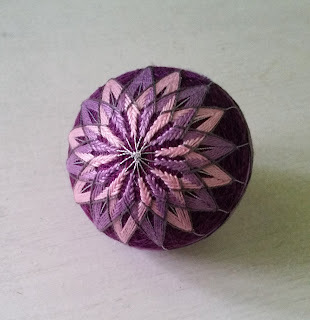 I was browsing needlenthread.com, saw and Myra Wood's online Craftsy class and decided to try it for myself. I wouldn't really wear a bead embroidered dress, so the little drawstring bag was a good project for me. Here's my version, embroidery finished, but not yet turned into a bag. 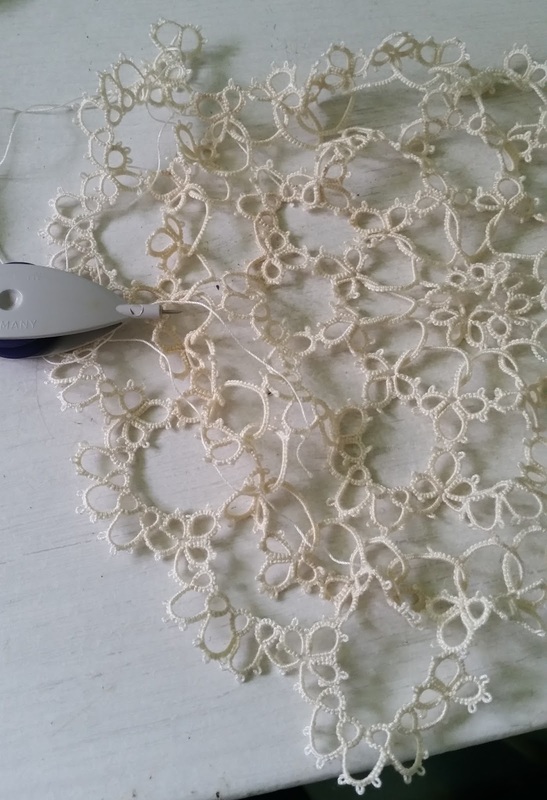 There are two unfinished doilies sitting in my drawers. I'm trying to finish them. It's not going well. Here's the smaller one. 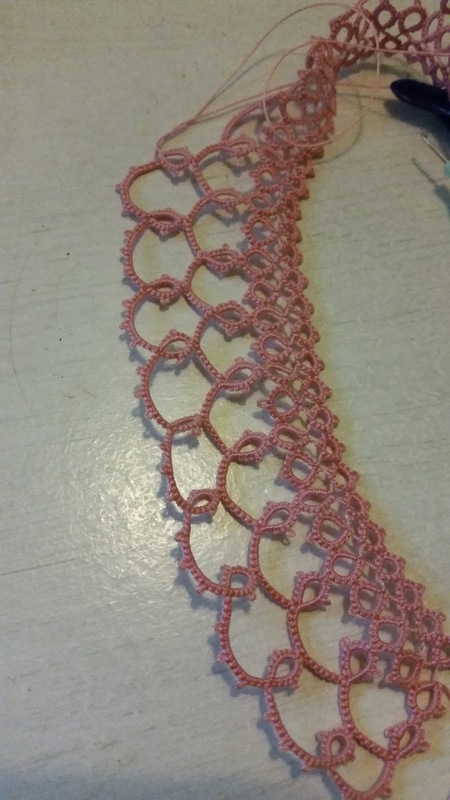 The pattern from a Japanese book, and it's supposed to be dainty and lovely. Right now, it looks like a dish rag. I know blocking will do wonders, but I had to take a break before I got discouraged. So I made a temari. 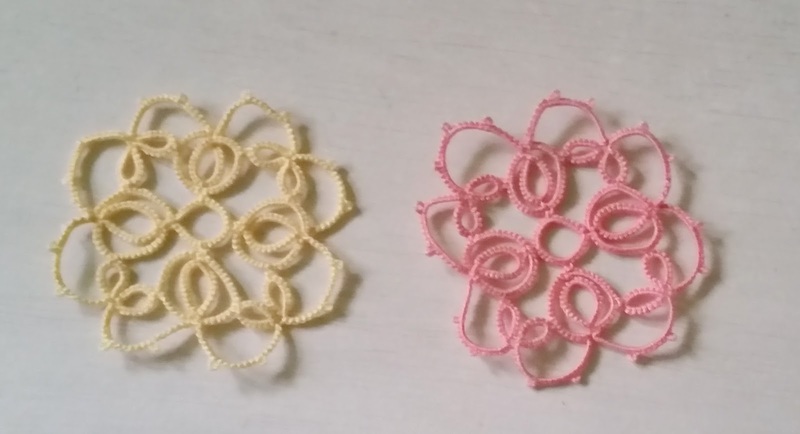 It's been a productive tatting week for me. 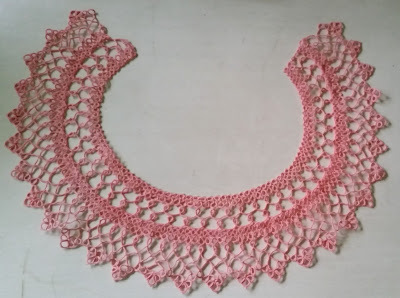 I finished a collar and an edging, both from the Tatter's Treasure Chest. 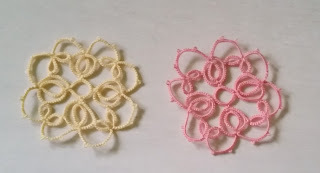 With the left over thread, I made these little onion ring motifs, from 'The Tatting Book 111'. And for a final distraction, there's this little bracelet, from a pattern of my own devising. 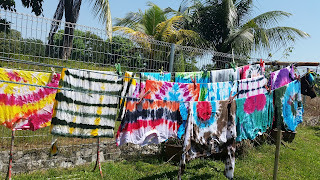 I tend to swing back and forth between my various hobbies. 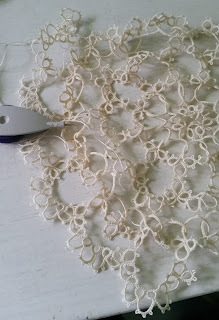 Right now I'm tatting, and starting too many new projects. That's the thing about a hobby though. You can start as many projects as you want. No deadlines, no pressure. 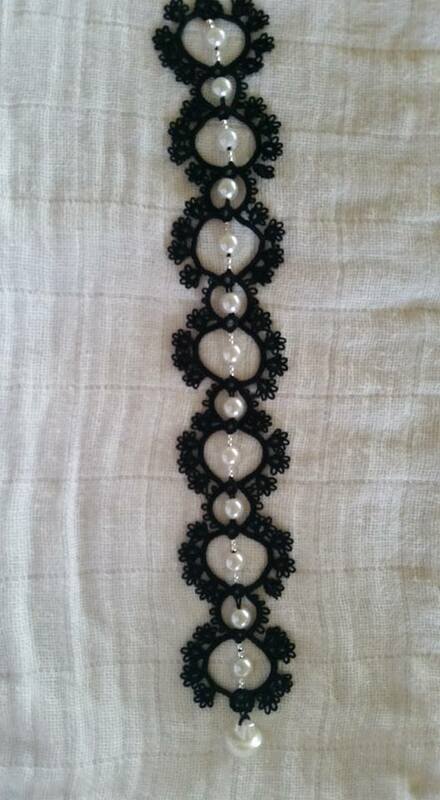 I'm working on a tatted collar. It's actually a re-make. I made one a few years as a way of coping with a truly painful work project. Unfortunately the stress shows in the work and there are shredded, discoloured parts where I pulled too hard. I also finished a Bloomer bracelet designed by Marilee Rockley. I made one out of DMC Cebelia thread. The little lady wore it to a school outing and it instantly turned into a floppy, fuzzy mess. 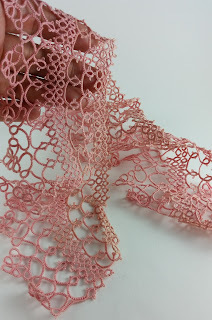 So now I'm on the lookout for a thread that works better for wear-ables. I wore this today and it seems to be holding up quite well.